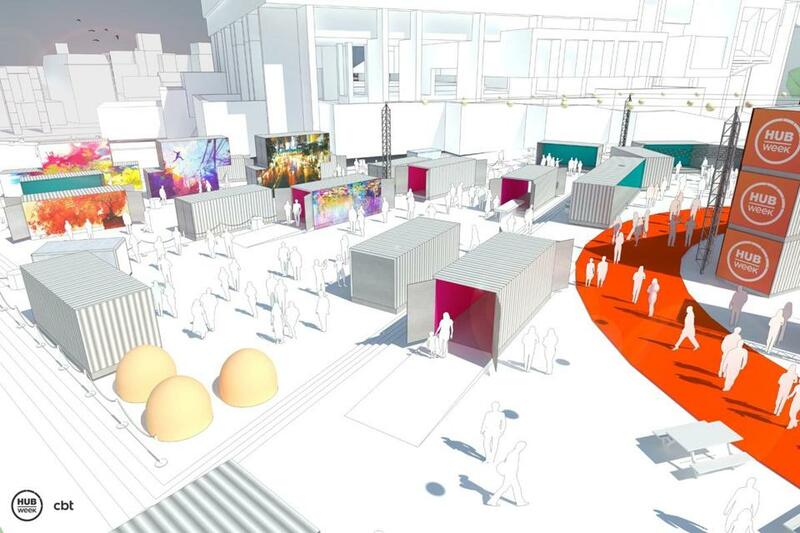 A rendering of the HUBweek installation at City Hall Plaza. 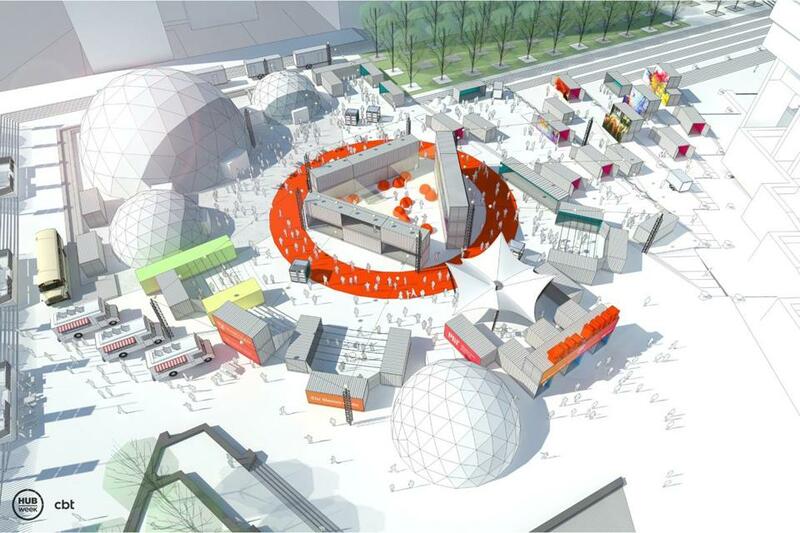 Organizers are planning a major change to HUBweek, the annual Greater Boston ideas festival: This year it will have an eye-catching exhibition space on wind-swept City Hall Plaza. For the first time, the festival will center around temporary exhibition space made from about 60 shipping containers, 3-D printed installations and — the highlight — four geodesic domes, large spaces built on skeletons made of short struts. The domes will host keynote talks and panels, video projections, music and live art performances, said Brendan Ryan, executive director of HUBweek. The shipping containers will host art and scientific installations, he said. The third edition of the weeklong fair, which aspires to be Boston’s artsy, high-tech answer to South by Southwest in Austin, Texas, will be Oct. 10-15. 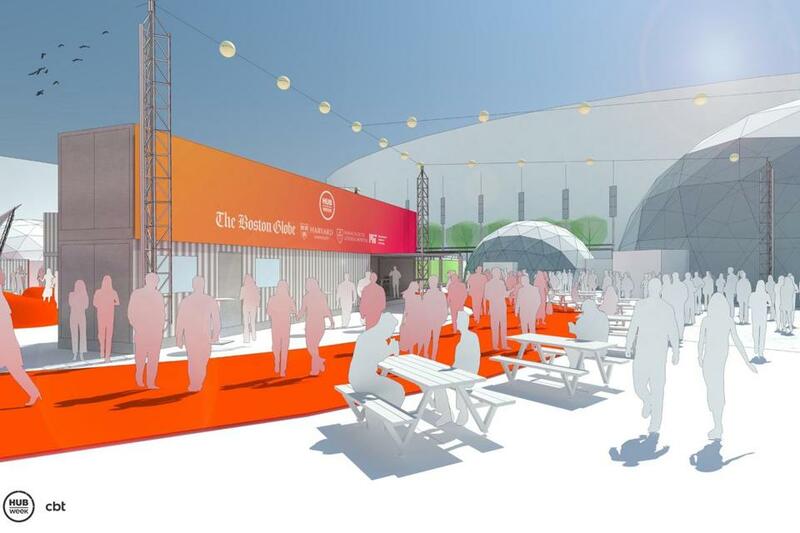 The plaza exhibition center, dubbed the HUB, will take about six days to build, Ryan said. New Yorker journalist Malcolm Gladwell, wellness author Deepak Chopra, and scientist George Church — who has been called a “maverick geneticist” and is trying to bring back the extinct wooly mammoth — highlight the roster of speakers for HUBweek, organizers announced Tuesday. HUBweek was founded by The Boston Globe, Harvard University, Massachusetts General Hospital, and the Massachusetts Institute of Technology. Globe Managing Director Linda Pizzuti Henry is chairwoman of the HUBweek board. In the past, HUBweek events were scheduled at venues around the city and region. This year, the first two days of events will take place across a number of city and regional venues; the program for the rest of the week will be concentrated at the exhibition space on City Hall Plaza, Ryan said. One of this year’s big-name, marquee events likely will be Gladwell’s interview of surgeon Atul Gawande. They will discuss innovations that will change how medical care is delivered. Gladwell is the best-selling author of “The Tipping Point,” “Blink,” and “Outliers.” Gawande is a surgeon, author, and researcher who practices at Brigham and Women’s Hospital and is a professor of surgery at Harvard Medical School. Fady Saad, cofounder and partnerships director of MassRobotics, said he has been involved in HUBweek planning, particularly in organizing “Demo Day,” in which start-up companies across more than a dozen industries will showcase their ideas. “We will reach out to the robotics community in Boston and New England and attract the best robotics, automation and AI start-ups to come and show the great stuff they’re working on,” Saad said in a telephone interview. He said he anticipates HUBweek will have representatives from companies working on self-driving cars. The HUBweek festival has drawn an estimated 20,000 registered attendees each year since its debut in 2015. A team from Booz Allen Hamilton compiled and reviewed HUBweek attendee data from last year, Ryan said. They found that 80 percent of attendees were from metro Boston; the remaining 20 percent came from 40 states and 49 countries. The event drew a crowd heavily made up of young people, with 39 percent in their 20s. About 58 percent of attendees were women and 42 percent male, according to Ryan. Many of the HUBweek events will be free. The festival’s website is HUBweek.org. Sara Salinas can be reached at sara.salinas@globe.com. Follow her on Twitter @saracsalinas. Mark Arsenault can be reached at mark.arsenault@globe.com. Follow him on Twitter @bostonglobemark.